Available in a black finish the RSX-3 is a two-way magnetically shielded speaker that employs a 3.5-inch Cerametallic™ woofer and 0.75-inch titanium-dome compression driver coupled to an exclusive round MicroTractrix™ Horn for maximum clarity and efficiency. 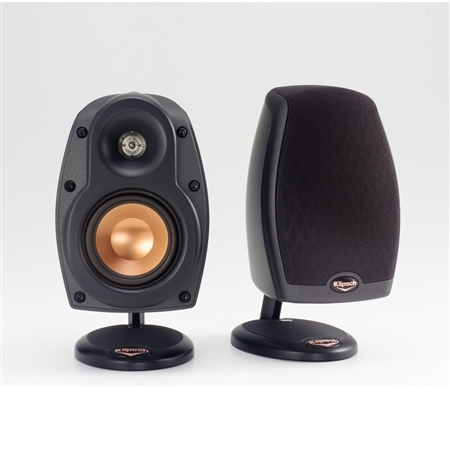 This speaker also features high-quality network components and premium internal wiring. The woofer is a long-throw unit driven by a powerful magnetic motor structure. The Cerametallic™ cone is lightweight with excellent rigidity which dramatically reduces any resonance. As a result the RSX-3 is capable of robust bass extending low enough for comfortable operation with today's built-in A/V preamp/processor and receiver crossovers. The RSX-3 has an integrated pedestal stand with a ball joint that allows it to be adjusted in almost any direction by using the provided allen wrench. A keyhole is featured on the underside of the stand base for no-hassle wall mounting. The speaker grille magnetically snaps into place over the front baffle while a sturdy five-way binding post ensures connection to any type of cable. The RSX-3 is sold in a single box that includes four RSX-3s and one RCX-3. This speaker is also available in a complete home theater package called the Cinema 6. This package includes four RSX-3s one RCX-3 and a Reference Series RPW-10 subwoofer. While no longer in production RSX 3 loudspeakers are still owned and listened to by Klipsch fans around the world. To connect with other people who are passionate about audio and interested in Klipsch products visit our open forum bulletin board.